Anti-government protesters in Bahrain gather in the capital city of Manama on Wednesday afetr the deaths of two protesters in clashes with police. Thousands of people had gathered Wednesday for a peaceful funeral procession for a Bahraini man killed when clashes erupted during another protester's funeral procession, the president of a human rights group said. Bahrain's Interior Ministry said those involved in the deaths of two people during recent protests are in custody. New York Times columnist Nicholas Kristof told "American Morning" that the protesters' demands are changing. Initially, protesters in Bahrain talked about wanting more democracy and to have political prisoners released, Kristof told T.J. Homes. 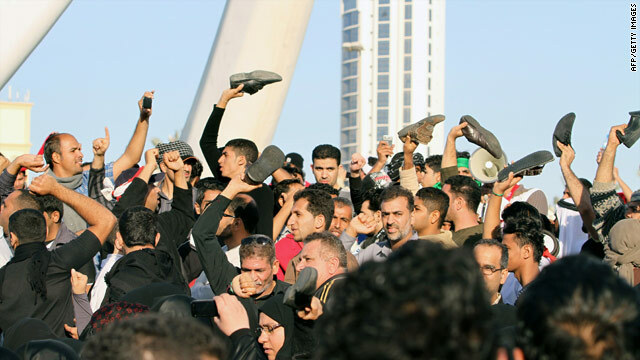 Increasingly, protesters are calling for the overthrow of the ruling family and the conversion of Bahrain into a constitutional monarchy in which the king would reign, but not rule, Kristof said. “They were really outraged at the government's brutality toward the peaceful protests earlier in the week. And at those two deaths,” he says. There is some uncertainty about where protests will go later today, Kristof said. Bahrain is being ruled by an autocrat similar to any other in the middle-east, who belonged to the minority Sunni cast and ruthlessly ruled over the majority Shia cast. The majority is being kept under iron fist using all draconian rules. Even majority has no voice in the government and in the jobs too. It is surprising to note that the USA is knowingly allowing this dictator to continue his grip violating all human rights laws at our cost. Can we dissociate our self from this and many other autocrats or still our greed for oil is more important than the blood of these unfortunates? Yeah, the Shi'ites have such a good record of democracy. How many Shi'ite countries allow women to vote? why dont they just open up some concession stands already.. this whould probably be the quickest way to stop all this messs..
Hopefully another U.S. crony will fall. The more,the better. It's about time the these people took their countries back from the West! The right-wing thugs in Washington will stop at nothing to keep their grip on the Middle East and that includes using brutal dictators,but hopefully that will change. Oh, don't worry, Ruffie, we can all tell the difference between the (im)posters! Why he can't post under his own username is beyond me; his (or her) posts are worth reading. Maybe he/she just *really* likes RUFFNUTTS! Obama has a golden opportunity to make history by decisively advancing freedom and democracy in the middle-east first and later in the South Asia, Africa and Latin America. His team members including Hillary and Biden are against of doing such heroic thing but they are timid and coward and just associates nothing more. Obama should take a serious look at this opportunity and grab it taking some risk of few unrest here and there for a while and unwanted democracy of few religious parties. But in long run his vision will be the new dawn for the 21st century and of course America. Come on john,get serious will you? Obama wants to preserve American control over the Middle East and these revolutions are "rocking the boat" so to speak! He already lost two of his cronies: Mubarak and Ben Ali of Tunisia. Or be smart about it and wait to help pick up the pieces. It has to come from the native people. The decision must be theirs. If we rush in we will be seen as fools and the people will see us as oppurtunist. @cesar, u have it right. What i don't understand, to say the least, is how we live in a nation of 300mil+ voiceless humans. A government that sings freedom and the importance of basic human RIGHTS; yet, pays trillions to dictate others. And we ask ourselves why those hurt people want us dead? Somehow, we must stop washington from misrepresenting our principles – they're not aggressive dictatorship, wars and murdering. Each dead protester blood is on our nation's hand. Please stop the violation of the geneva convention. Respect other nations and its people and put stop to the ligal slavery policies, B. OBAMA!!! Good posting,Rodja. I'm sorry abut the jerk who keeps on posting nonsense under my name. Please ignore him. What if the middle east is not trying to start democracy but to erupt into a religious revolution against the US and Europe. They may be playing us. Using tweeter and face book to unite. Sorry folks, I didn't post either of the two above posts. Hey, silly boy, I wish you would post under the name Priscilla. Stop being so negative and serious you boring stiff. @Cesar/Priscilla: I'm waiting for your imaginary friend Mohamad to insult me; so when do you begin? @Priscilla, hello. Oh I forgot, you're sleeping. Personny says "Israel is becoming a nation."